What is an ARX session? How about the older person? In recent years strength training has taken its proper place as an important element of overall fitness. Recent research has glorified strength training as necessary for all ages from the young to the elderly. Indeed, trainers now recommend that more gym time be spent on strength training instead of cardio [See References]. I have been involved in fitness at all levels for many, many years now. And yes, even at the tender age of 64, I consider myself athletic. I still look to do things I have never done before, in terms of my strength and coordination. (Documented on my YouTube channel). So when I had an opportunity to challenge myself with a new weight-lifting concept, I took it. After all, I like experimenting with new things and strange concepts. 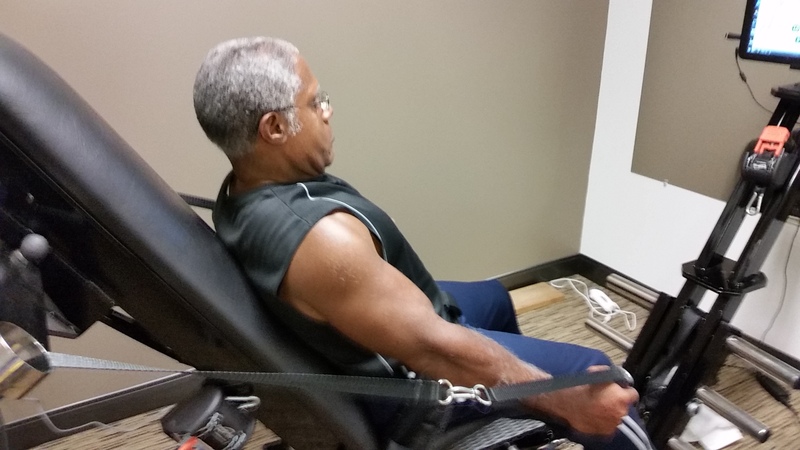 A cohort of mine introduced me to Adaptive Resistance Exercises using an ARX Omni machine. Don’t feel bad if you don’t know what this is. I didn’t either. Zander Health and Fitness has leased an ARX Omni, making it locally available to the Nashua NH area. You can find other ARX studios throughout the country, and the number of locations is increasing. My experiences with this were a real eye opener, and taught me several lessons about myself and strength training in general. I’ll do my best to describe things here. But it is something you just have to experience for yourself to understand. One session on this equipment with a quick follow-up white board talk could take the place of volumes of blather from me about it. Imagine pushing (or pulling, lifting, etc.) an object that is infinitely variable in weight, but can only move at a constant rate (x ft./sec.). When you push harder, the object becomes heavier. As you push softly, the object becomes lighter. But as long as you are pushing, it will move only at a constant rate(x ft./sec. ), no matter the force of your pushing. The changes in weight occur instantaneously, providing no delay in responding to a change in your pushing force. But the rate of movement (x ft./sec.) does not change.Further imagine that you can see the pushing force you are exerting and can compare that force to earlier attempts at moving this object. The intensity of your pushing force is being recorded by this object and you can compare that to previous attempts. For most of us, this creates a psychological condition where you are constantly trying to beat your truest competitor – yourself. Something inside of you suggests that you have to push harder than you did before. Although there are many details missing, this is the basic concept of Adaptive Resistance Exercises. The Manufacturer (ARX) calls it “motorized resistance”. A variety of videos and websites explain the concept in greater detail. (See references) So let me jump right into my direct experiences the ARX Omni machine itself. ARX Omni provides no resistance. It merely moves through your range of motion at a pre-set speed, unchangeable and unstoppable. Using a motorized drive belt, software calculates the resistance that you put up and maximizes both eccentric (the muscle lengthening under load) and concentric (muscle shortens under load) movements of an exercise. In seeing this, I immediately saw the first advantage of this machine over that of conventional weights. In the gym, we use a load (weight) that we can safely handle in both the eccentric and concentric movements. But most of us are weaker in one of these directions. We must therefore limit the weight we are using to handle the weaker direction, sacrificing the exercise we give to the stronger direction. The ARX will maximize both directions of a movement regardless of the imbalance. And it will do it safely without having to handle loads that are unsafe in one direction or the other. There are about 15 different standard exercises that can be performed with the ARX. These include belt squat, calf raises, deadlifts, rows, a variety of presses, pulldowns, shrugs, curls, and leg and triceps extensions. To give a better idea of what this whole thing is about, I’ve included a short video of one of my sessions. You can see a portion of the machine, hear the motorized hum, hear my trainer, Doug, spur me on, and see the exertion I am experiencing. I will come back to other aspects that can be seen here. But for now, the video serves to help clarify what is admittedly a confusing concept. 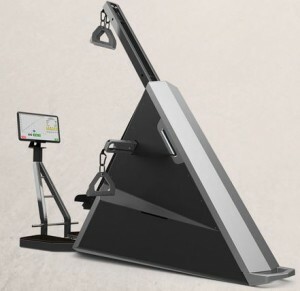 This machine provides you with a mountain of data about your exercise session. After all, everything about it is controlled by a computer. It records the amount of force you exert in both directions of each exercise. 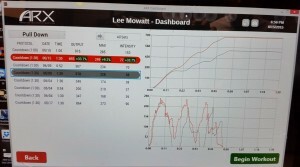 It has graphs for each moment you are “under load” during your session. This data is difficult to consume at first. But after a couple of sessions the data starts to make sense and you can begin to compare yourself to previous sessions and actually quantify your progress (or lack of it). I found the cumulative graphs to be most useful as it told me the amount of force over time that I exerted, which is a measure of both power and muscle endurance. You can see examples of these graphs in the pictures below. My attendant, Doug, explained them to me in a manner that I could consume. The amount of information in both the instantaneous graphs and the cumulative graphs was impressive. The above picture summarizes a workout session. 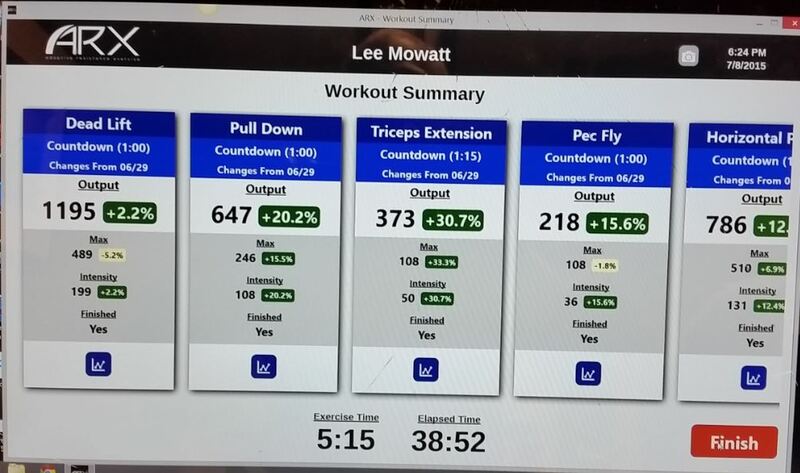 It lists the exercises I performed and compares that performance to a previous session. Any previous session can be selected for comparison. The thing of note for me was those times at the bottom of the picture. For a 38 minute session, I was “loaded” (e.g. exerting muscular force) for only 5 minutes and 15 seconds. Don’t let this short load time fool you. I was surprisingly sore the next day. 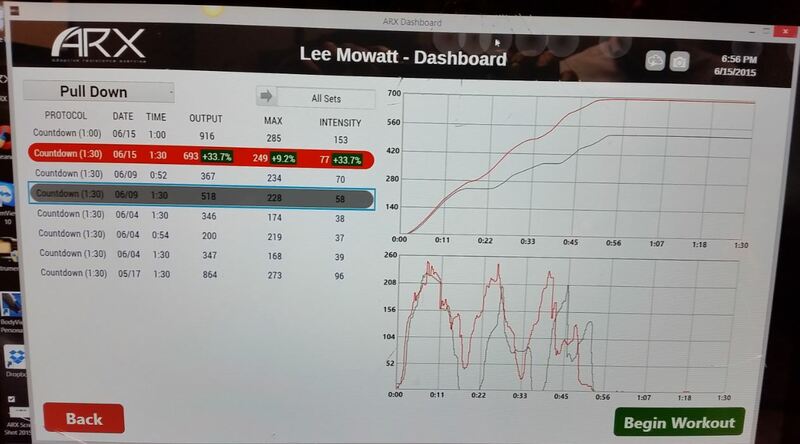 In this picture you can see both the cumulative graph (top) and the instantaneous graph (bottom) for the pull-down exercise I performed during the session. The red lines are my results for that day, while the gray lines are the results I had in a previous session. I noted that I could compare any two workout sessions as I wished. The software is fairly flexible. From the above data, you can see that I outperformed my previous session. The bottom graph shows that I did 3 repetitions and reached higher peak force than the previous workout. The upper graph indicates that I exerted more force over the same amount of time. In other words, I was getting better. 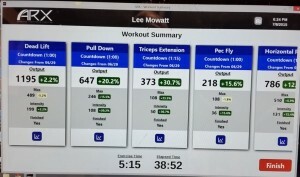 Because the data seems to be always staring you in the face on the monitor, it encourages a fierce competition within you to outperform your previous workouts. At least that is how I reacted to seeing my earlier performance right in front of me in the middle of my current session. I really felt the drive to beat … me. For me, I found one of the important elements of using a machine like this is the trainer or attendant. He or she becomes your workout partner. He must understand your training goals and introduce you to the various aspects of the machine. He helps you to understand the copious amounts of information that the machine records about your exercises. He helps you to chart and understand your progress. To use the ARX Omni you schedule a session through the Zanders website . According to the website, the introductory session is 40 minutes long. Subsequent sessions are twenty minutes long. The extra time for the first session is to help you become familiar with what the machine does and how you are going to interact with it. During the session you are typically performing a selection of standard exercises, such as you might perform using regular weights (e.g. curls, pulldowns, squats, shrugs, etc.). The exercises can be modified to some extent to support personal goals or limitations. But Doug and I went wild in altering things. These modifications cost us in setup times. Changing from one modified exercise to another took longer. Neither Doug nor I were overly concerned about the 20 minute limitation. But I don’t think any of my 8 sessions could have been confined to 20 minutes. With that being said, it is really the “time under load” that matters in the session. You can see in Figure #1 that, although the session lasts about 39 minutes (38:52), I was under load only a bit more than 5 minutes (5:15). But my body felt pleasantly exhausted when that session was over. And I felt the exertions on the following day as well, telling me the muscles had been adequately used. For each exercise, you only need to do 3 to 5 repetitions of each exercise. You are working at an intensity level where it would be difficult to do more than that. And research shows that this is all that is needed for effective strength gains. I was curious to see if the ARX claims and theories were true. As I am a 65 year old who takes pride in remaining strong as I age [YouTube channel], I felt qualified to test the premises. Let me cut to the chase here and say, in no uncertain terms, the ARX is quite effective and the claims on the website appear to be true (although a few of them need a bit of explanation). Not only could I see the data that indicated improved strength, but I felt the same in my body and in my normal gym workouts. I have been building or maintaining strength all my life. The strength gains I experienced in the 2 months (8 sessions) of ARX sessions seemed equivalent to about 4months of what I might have normally done in my regular workouts in the gym. The ARX will most certainly build your strength. But only dedicated practice will build skills. If you need to build strength quickly, I have found nothing better this. Because I can spend less time than before in strengthening my muscles, this is a tremendous boon to busy people like me. I am still integrating these sessions into a hectic schedule, but Zanders is pretty flexible even though its hours are restricted to evenings and weekends (at the moment). The benefits of the ARX do come with a few considerations. These are probably specific to me, but I mention them here in case they may be relevant to you. Most of them won’t be. The importance of a trainer: I found the quality of my workouts to be very dependent on Doug, my trainer. His presence and encouragement pushed me through. He was experimenting with me. We both were interested in finding out how much this machine could do for me. After all, I was the oldest person he had on the ARX thus far. Part of my results belongs to Doug, since he supplied significant motivation. 20 minute sessions: An ARX session is listed as 20 minutes in duration. Perhaps because of the experimentation that Doug and I were doing, but all of my 8 sessions exceeded that time limit. We were both playing and discovering, and neither of us seemed concerned about this time boundary. But I’m not sure if we could have confined any session to 20 minutes without drastically changing the nature of our interactions. Another factor here is the substantial modifications we made to some of the exercises. These modifications consumed extra time for setup. I can only assume here that Zander has enough experience to know that 20 minutes is enough for most people. But it didn’t seem long enough for all the chattiness that Doug and I engaged in during my sessions. Your mileage may vary. Cost and Scheduling: Zander is still exploring what pricing structure works best for its clients. They are presently offering a monthly cost of $85, which will give you up to 6 sessions per month. I think this is your best option for cost effective workouts. There are other arrangements possible (visit their website), but this one makes more sense to me considering my habits. They are also partnering with Physical Therapy clinics to give access to patients. So things are still in flux in this area. Grip Issues: On a few selected exercises such as the dead-lift and its variations, the force that the back and legs can exert is typically greater than the forearms, biceps and triceps. It is during such exercises that you may experience hand grip issues, as I did. During these exercises, my grip was not able to sustain a steady hold on the straps. This, of course, compromised my performance during these exercises. Will the ARX Omni work for the older person (55+)? I see no reason why it shouldn’t. It will certainly increase strength. And strength will support bone density increases, balance and a host of other benefits. However, it does not address the cardiovascular aspects of fitness. But, for me, strength is the cornerstone for the rest of my fitness. And recent research bears this out. A strong body finds its balance more easily. A strong body keeps its coordination longer. A strong body enjoys life more intensely. More and more studies are showing that getting stronger opens the door to all aspects of fitness. How does this compare to traditional weight lifting for older adults? Weights are certainly more convenient, since you can buy a set of weight for your home and use them any time you wish. But I have found that approach to be much overrated. I haven’t seen anyone succeed in their goals that way. The motivation, engagement and sense of commitment we get by going to a gym or ARX session is so much greater. Most of us (including me) don’t follow through on private plans to get fitter. That equipment we bought for our home ends up being a waste more times than not. The resistance you experience can never be excessive since you cannot exceed your own force. So the safety factor is there. (Weights can hurt you.) This is a big concern as we age. The ARX Omni does bring something new to the table. The concepts and technology are sound. And I am personal proof that they work. But I would love to see a 75 or 80 year old work this machine and monitor their results. It would be exciting to see older seniors understand what greater strength would do for them. This entry was posted in Health & Fitness, Product/Service Reviews and tagged Adaptive Resistance Exercise, ARX, ARX Omni, fitness, growth-works, Lee Mowatt, muscle building, Physical Therapy, Rehabilitation, Strength Training, Zanders Health. Bookmark the permalink.